CHASKA, Minn. (March 31, 2017) – Intergenerational Living & Health Care, Inc. (ILHC), a nonprofit organization pioneering interactive programming to bring children and seniors together, based in Minneapolis, has purchased an option to acquire approximately 57 acres overlooking the northern end of Long Lake just east of Rutherford Elementary School on the western edge of the city of Stillwater. 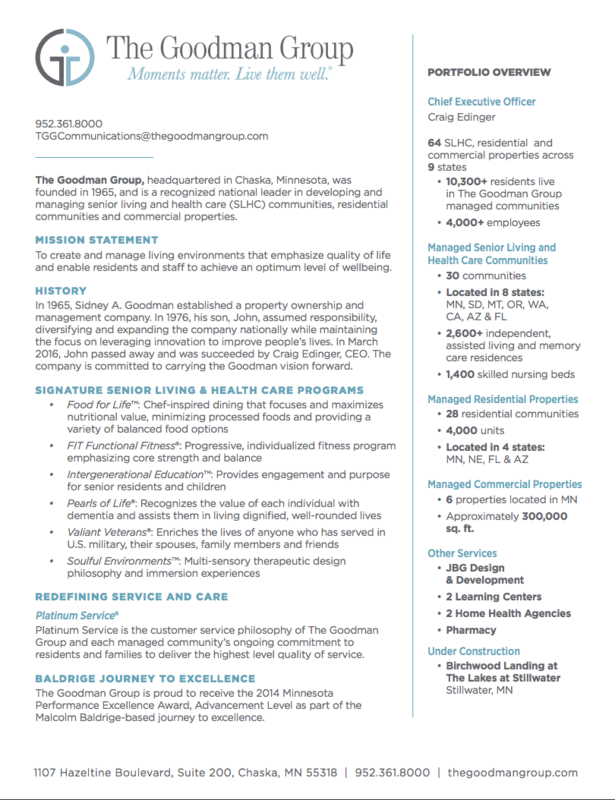 The owner and operator ILHC is working in collaboration with developer and manager The Goodman Group LLC, a Chaska-based, 50-year privately held senior living and health care management company, with a focus on creating innovative person-centered lifestyles for healthy aging and wellbeing. The co-real estate developer of the project is Northland Real Estate Group, LLC, a Twin Cities-based commercial real estate investment and development company focused on senior living housing, multifamily, and commercial properties in the Midwest. The Goodman Group team has researched the formerly proposed Croix Bay development history in detail to assure that the comments of the City Council and surrounding neighborhood are well reflected in the forward planning of the future site. The company plans to construct an approximately $70 million mixed-unit senior living community over three development phases. Phase one is a 139-unit independent, assisted living and memory care community. Phase two will include 30 independent living villas that will be accompanied by 70 apartments for active adults in the third phase of the project. The Lakes at Stillwater will be a vibrant senior living community inspired by the natural beauty of the surrounding scenic lakeside landscape, offering a healthy aging lifestyle, hospitality services and amenities, intergenerational programming and exceptional care services. This scenic site has been part of a “Forest Stewardship Plan” and was recently reforested with thousands of DNR-raised seedlings. The Goodman Group has a longstanding senior care management philosophy recognizing the healthy aging benefits associated with access to nature and intend to protect the green space by continuing with the reforestation stewardship program. The design and architecture will complement the heritage of the site and surrounding community. For more information, visit www.thelakesatstillwater.org, email info@thelakesatstillwater.org, or call Christine Cobb at 952-361-8086. Intergenerational Living & Health Care, Inc. is a nonprofit organization pioneering interactive programming to bring children and seniors together in order to cultivate understanding, support, and purpose, and share the inherit wisdom between generations. Based in Minneapolis, the organization has health care, assisted living and residential communities in several states, as well as a unique early childhood center located in Eagan, Minn. Visit www.iglhc.com. The Goodman Group LLC, a Chaska, Minn.-based company, is a leader in developing and managing senior living communities, residential communities and commercial properties. The Goodman Group is a privately held company with 50 years of experience, overseeing communities with more than 13,800 residents and 4,300 team members in 10 states. Platinum Service® is the centerpiece of The Goodman Group’s promise to deliver an unparalleled service experience. We specialize in the development of proprietary programs and services to encourage residents’ optimal wellbeing. Recipient of the 2014 Performance Excellence Advancement Level Award, based on Malcolm Baldrige Criteria. First long-term care and residential management company in Minnesota to be proclaimed a Yellow Ribbon Company. Visit www.thegoodmangroup.com. Northland Real Estate Group, LLC is a Twin Cities-based commercial real estate investment and development company focused on investing in and developing senior housing, multifamily, and commercial properties around the Midwest. Strong local connections, creativity, and perseverance give Northland a competitive advantage in sourcing new opportunities and meeting partner and community objectives.